The male Turquoise Parrot is one of the most spectacularly coloured birds found in north-east Victoria, with his striking blue face and wings, bright yellow front, deep green back and red shoulder patch. The Warby Ranges and nearby Chesney and Mokoan Hills are part of aninteresting story behind this bird, which is somewhat of a local icon of the Glenrowan region. During the 1920s, the parrot became almost extinct in Victoria as a result of habitat clearing, especially loss of nesting sites. Populations re-established in the 1940-50s in and around the Warby Ranges where the species is still restricted to certain areas but now considered locally secure. Turquoise Parrots are primarily birds of open woodland habitat, especially undulating areas that border larger forest patches such as the Warby-Ovens National Park and the Mt Meg Nature Reserve. In spring and early summer during the breeding season, they are typically found in pairs. Nest sites consist of small hollows in stumps and low in trees, usually within 3 metres of the ground and often close to water. Up to 5-6 young are produced each season. After breeding, in late summer and into autumn, flocks usually form which may number in excess of 50 birds. At this time, they commonly occur in more open farmland areas adjoining their usual lightly forested habitats. They are an unobtrusive bird that feed quietly on the ground on small seeds of native grasses, herbs and shrubs. They give a distinctive high-pitched call when flushed and their contact call is a lovely soft tinkling whistle, often given in flight. 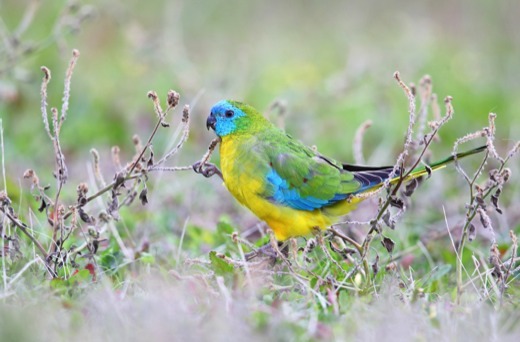 Together with landholders and the local community, works are underway to find out more about the Turquoise Parrot and to restore its habitat so that this beautiful bird, will continue to flourish in the Warby Ranges and surrounds.